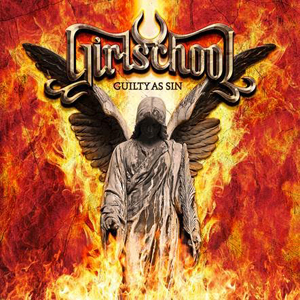 GIRLSCHOOL Unleash New Track "Take It Like A Band"
Legendary London-based hard rock quartet GIRLSCHOOL will release their 13th studio album, Guilty As Sin, next Friday, November 13th in North America via UDR Music. The record is available for pre-order in red colored vinyl, digital download (with the first single "Come The Revolution" - only available otherwise on the physical US edition - as an instant-grat track) and digipack (with bonus track) formats. In celebration of next week's release, the band is streaming the album cut "Take It Like A Band" and you can check it out below. Produced by Chris Tsangarides (JUDAS PRIEST, THIN LIZZY) at the Ecology Room Studios in Kent, England, Guilty As Sin includes 10 tracks of the driven, melodic yet gloriously riff-heavy rock'n'roll that Kim McAuliffe (vocals and guitar), Enid Williams (vocals and bass), Jackie Chambers (lead guitar and backing vocals) and Denise Dufort (drums) are world famous for. Featuring raw, energetic, killer cuts such as "Take It Like A Band", "Treasure" and "Come The Revolution", Guilty As Sin is soaked in the late-night spills 'n' sweat of beer, cigarettes, denim and leather - a timeless evocation of how it feels to throw away all life's BS and get down'n'dirty with loud, crunchy yet catchy rock 'n' roll. There's also time for two storming cover songs (the superb, swaggering rock version of THE BEE GEES '70s disco classic "Stayin' Alive").